We will provide regular updates to this page, to show the public how development is progressing. It’s been a really busy time down at the Bury Safety and Training Centre. Since the start of 2019, the centre has held a number of events and have plans to continue to hold more over the coming months, with the aim to encourage involvement within and around the centre. Here are some of the highlights since January. Bury Training and Safety centre held a ‘Time to Talk’ mental health day, February 7. The aim of the day was to make colleagues increasingly aware of mental health and how it can effect work. The day was led by the Centres ‘Blue Light Champion’ - an employee dedicated to raising awareness of mental health and breaking down stigmas surrounded by mental health in the workplace. There was the opportunity to chat, have a cup of tea and some cake, and most importantly create an environment where everyone felt comfortable. It was also a really great way to integrate new team members into the force and encourage inclusion. Time to Talk was a simple and easy way to remind everyone the importance of conversation and creating a comfortable environment for people to express their worries. Over January and February the Training and Safety Centre held a number of inter service transfers sessions. Firefighters from different brigades attended a four week course on the outdoor training facility to further their knowledge and become part of the Manchester brigade. New recruits had the opportunity to be involved in an exciting training session. This session was set up to replicate a house fire involving two terrace houses. The scenario was a ‘persons reported’ and ‘confirmed fire’ situation which involved various stages; including: initial entry, withdrawing with a casualty and re-entering to continue and a final withdrawal. This session was a really great way for the new recruits to practice their skills for a real life scenario. The centre held a Careers event, March 22, inviting both College and High School students to attend the centre to find out more about a possible career in public service. There were a number of different activities happening outside the centre; Mike Dewar attended with the dogs, the Army brought their climbing wall, and there were two pumps – the parade pump and a pump from Bury Community Fire Station. The day was a success with great feedback back students and tutors with another event to be planned later in the year. The next event will be the Spring Event which will take place on 26th April. This event aims to educate primary school children on water and road safety. When groups visit the Safety Centre we teach lots of information about home and fire safety. They way to test to check how much people have learnt is by taking a quiz before and after the visit. We have seen some amazing results from the different groups that have come to visit us, and would like to share these with you! Harpurhey Alternative Provisions School students came on 28th March 2019 and showed that they learnt loads from the visit. There is a significant improvement in their knowledge afterwards. In particular, you can see that before the visit, only 20% of the students knew to test your smoke alarms once a week. However after the visit, 100% of them knew how often to test their alarms! This is an improvement of 80%, which is amazing! The public services students from Trafford College visited on 1st April 2019 to learn more about the types of emergencies we attend, job roles within the organisation, fire and home safety and ways of getting involved with the fire service. The students demonstrated excellent teamwork and listening, proved with their excellent quiz results. Well done! On 3rd April 2019 students from year 3 – 6 from Al Huda Primary School came to visit. They started the day with a good basic knowledge on fire safety, scoring 71%. Then by the end of the visit the students left with 95% on the quiz, meaning there was an improvement of 25%. This was an incredible achievement and you can see that the students worked really hard during the visit! At the Safety Centre we teach people in the community all about how to keep themselves and others safe from fire and other dangers they may face. When people come for a visit they are tested on their fire safety knowledge before and after, so that we can see how helpful the Safety Centre has been. We have been hard at work to make sure that everyone who comes to visit are learning lots in a fun and engaging way and we want to share some of the fantastic results we have had recently! A massive congratulations to St Ambrose Barlow on their visit. As you can see everyone left the Centre with 100% knowledge on fire safety! The team at Bury Training and Safety Centre have been busy over the past month developing lots of new and exciting things for everyone to come and enjoy! We have created new educational programmes for KS1 and KS3/4 students. We have lots of interesting activities incorporated into the visit, as they are tailored for each age group. In the KS1 visit it has a heavy focus on ways to keep yourself safe by teaching: road safety, making 999 calls and how to keep yourself safe from fire. The KS3/4 programme offers the chance for youth led work around the safety centre where the young people have the opportunity to investigate a road traffic collision, debate the consequences to acts of arson and discuss home fire safety. We are open for bookings from anyone in the community, so feel free to get in touch to make a booking or find out what we can do for you! It's been a busy start to the year at the Safety Centre with lots of visits happening from all different age groups. On 28th March and 1st February we welcomed 60 Public Services students from Wigan and Leigh College. They learnt all about fire safety in the home, smoke and carbon monoxide alarms, escape plans, the five main causes of fire and basic life support including the recovery position and high performance CPR. We spent the afternoon working on teamwork skills and fitness by hose running in teams. It was excellent seeing everyone working hard in their teams, encouraging and helping each other. We've not had all of our feedback yet, however Gareth Hayes, Public Services Teacher from Wigan and Leigh College, has said: “I have had some feedback already from the trip and it has all been very positive, with some learners saying it is the best trip they have been on”. What’s going on at Training & Safety Centre? December was a busy time for us at the Training and Safety Centre; here we share with you some highlights. At the start of the month, Mayor Andy Burnham visited us. Andy had been travelling around to the different stations in GMFRS for question and answer sessions surrounding the service wide review. It was an excellent chance for staff to share their views, opinions and ask any questions in an open forum. Rumworth Special School joined us for our first Winter Wellbeing event on 14th December. The young people were lead around the centre, learning different ways to stay safe and well. They worked together to perform a safe and well visit in a home, finding lots of hazards and learning escape plans. Afterwards, we all headed to the café where we met a group of firefighters who answered many interesting questions, demonstrated the equipment and then joined us for mince pies and bingo. Addiction Dependency Solutions then joined us on 18th December for a performance, cake and carols. The performance showed many issues that are prevalent in winter. Some of the main issues we focused on were homelessness, debt, loneliness and caring for people in the community. To show these we included scenes that showed a person who was homeless taken somewhere to get food and a bed. In addition, we looked through a window to a ‘perfect’ family scenario before going into the home and seeing the money troubles that hid behind the smiles. To end the day we gave the guests a chance to make a pledge this Christmas to either: offer advice to anyone in need, help the homeless, take care of themselves, or visit an elderly neighbour. A massive thank you to everyone who helped with these two winter events, including the different services who were there for anyone seeking advice around these issues. On 20th December, we celebrated the last Passing Out Parade of 2018 with our 55 recruits, following an intensive 13-week operational training course. The event celebrates the recruits’ achievements with a warm welcome to Greater Manchester Fire and Rescue Service (GMFRS). The trainee firefighters showed off their skills, giving demonstrations on how we use the latest technology to save lives. A variety of scenarios took place on the training yard including extinguishing fires, rescue of a person and CPR. It was lovely to have you at the Training and Safety Centre; we hope you have a very happy and successful career at GMFRS. Congratulations to you all! Recently, Bury Training and Safety Centre hosted an afternoon to remember for 13 year old Rhys Williams who suffers from a rare skin condition called Epidermolysis Bullosa. After hearing about his love of the fire service, the staff devised a special visit for Rhys, his family and some of his friends. After a quick ride out in one of our fire engines, Rhys attended a persons reported incident at Bury Training Centre, and got to see close up exactly what it is like to be a firefighter. Rhys and his guests took a special private tour of our State of the art Safety Centre, followed by a game of bingo and a party (which were listed on Rhys’s bucket list!) A great afternoon was had by all, and we all really enjoyed meeting Rhys and his family. This is your invitation to come and join us at the Bury Training and Safety Centre for an immersive, inclusive and interactive learning experience designed for all members of the community. We provide educational experiences tailored to primary school pupils on fire safety, road safety, health and wellbeing. We can also deliver CPR instruction to pupils and discuss the science of fire and fire investigation. We also link in with SMSC requirements by supporting pupils to develop their confidence, self-esteem, show initiative and to take responsibility for their behavior as an active citizen. Visits to the Centre are free of charge. 45 KS1 children from 10am-12.30pm. 60 KS2 children from 10am – 2.30pm. Feedback from schools has been fantastic so far, but don't just take our word for it! We hope that you will join us for the visit that could save your life. What’s going on at Bury Training & Safety Centre? It’s been a busy couple of weeks here at Bury Training & Safety Centre, here we share with you some highlights from welcoming an award winning dog to hosting training for new firefighter recruits! Watch this space for upcoming Treacle events. The Centre opened in 2017, a purpose built facility which hosts one of the world’s most advanced firefighter training grounds and an interactive and immersive education Centre. Since opening we have welcomed over 10,000 visitors. School groups and community groups are invited to visit the site for free and step into the shoes of a firefighter! Visits are delivered by experienced staff with fire safety and education backgrounds and can be tailored to meet individual needs. Get in touch to find out more! We were delighted to welcome Echo the rescue dog and his trainer Mike Dewar. Echo will be presented in October with a PDSA order of merit which is the equivalent to an OBE for a human. He lives at home with Mike were he spends his days retiring to the living room floor and teaching the young pups the tricks of the trade. A huge thank you to ITV for choosing to film here. On Monday 17th of September, Burgoynes hosted a fire investigation event here. 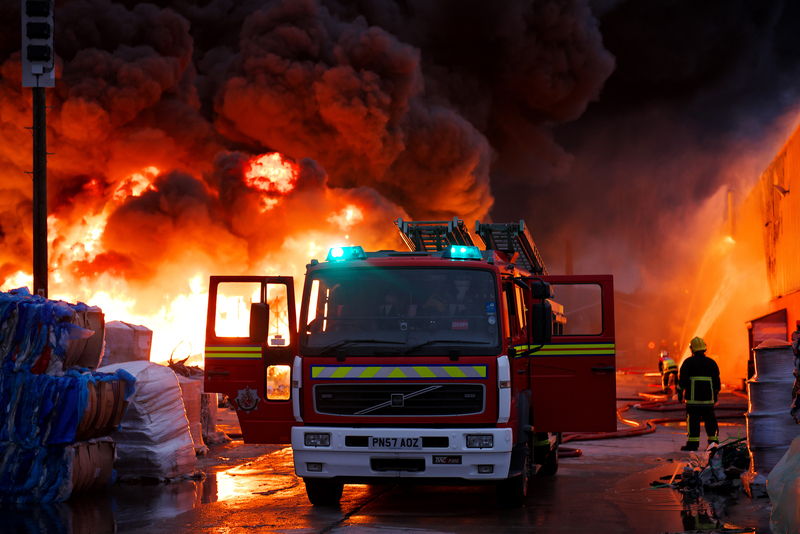 The firm of consulting scientists and engineers specialise in the investigation of fire, explosions and major incidents. The street area was transformed into a spacious presentation space, visitors were also able to take part in interactive workshops inside the full size house on site and operational crews showcased specialist service equipment. To close the day, guests were treated to ice creams! We welcome enquiries from businesses regarding event hosting and corporate away days. In the classroom, IST's were supported by members of the Training team and Community Instructors from the Safety Centre to work through the prevention and protection programme, preparing presentations for delivery in primary schools and undertaking mock Safe and Well visits. The practical training includes set familiarisation, search patterns, hose management and branch techniques. As the knowledge and skills develop they are exposed to more realistic scenarios. They also received fire science input followed by a practical demonstration. Tickets are FREE of charge and can be booked here! Bury Training and Safety Centre was honoured to host ITV Granada Reports as we celebrate the success of two of our fire dogs: Echo and Cracker. The two fire dogs, who are no longer in service, are to be awarded the PDSA Order of Merit at a special ceremony in October. The PDSA Order of Merit recognises animals that display outstanding loyalty or service. Both dogs have given a decade of service to the Greater Manchester Fire and Rescue Service - and are being recognised for their incredible skill. Cracker was a Fire Service Investigation Dog and was trained to detect 20 different types of accelerants. She has helped bring more than 200 years of custodial sentences to arsonists. We are all extremely proud of Echo, Cracker and of course Mike Dewer - their trainer! We are busy here at the Training and Safety Centre getting ready for our busiest time of the year... That's right Halloween! At the moment we are planning our Trick or Treat surprise for the community of Greater Manchester.